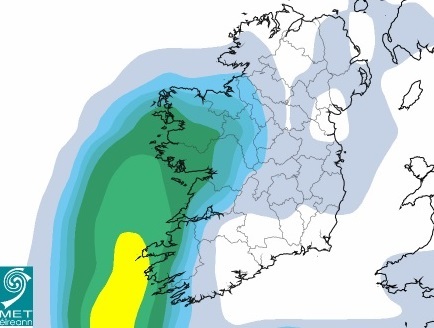 Following an intense day of rain in most parts of the country on Friday, Met Eireann has issued two further rainfall warnings for today (Sunday) and tomorrow (Monday). A ‘Status Orange’ rainfall warning has been issued for Kerry. Met Eireann forecasts heavy rain through Sunday and Monday with accumulations of 50-70mm possible. Meanwhile, a ‘Status Yellow’ rainfall warning has been issued for Galway, Mayo, Clare, Cork and Limerick. Met Eireann says further heavy rain will fall in these areas through Sunday and Monday with accumulations of 30-50mm possible. Met Eireann also says some areas will remain dry today but many parts will have outbreaks of rain. Some heavy downpours will occur with poor visibility and some surface flooding. Met Eireann says towards evening strong northwesterly winds will develop along west and southwest coasts. Tonight, it says further heavy rain over Connacht, Munster and south Leinster with possible flooding. Lowest temperatures 10 to 12 degrees. On Monday, Met Eireann says it will be mainly dry over Ulster but further heavy rain elsewhere with possible disruption in places. A cool, breezy day is forecast with with highest temperatures only 12 to 14 degrees in fresh northerly winds. It takes longer to stop a vehicle on wet roads so slow down and allow extra distance between you and the vehicle in front, four seconds at a minimum (use the two second rule and repeat it twice). Take special care when driving behind trucks or buses as they generate a considerable amount of spray which reduces your visibility. Watch out for vulnerable road users such as pedestrians, cyclists and motorcyclists. Use dipped headlights at all times of poor visibility not parking/side lights and fog lights. Be mindful of aquaplaning on roads where 100/120kmh speeds apply. Aquaplaning occurs where the tyre thread fill with water and the driver is at risk of losing control of the vehicle. Pedestrians, cyclists and motorcyclists are advised to be seen. Wear bright clothing with reflective armbands or a reflective belt. Pedestrians should walk on a footpath, not in the street. Walk on the right-hand side of the road, facing traffic if there are no footpaths. Monitor radio weather broadcasts while travelling. If the road ahead is flooded choose another route, do not attempt to drive through it. Flooded roads that appear shallow could be deeper than you think. After going through water, drive slowly with your foot on the brake pedal for a short distance – this helps to dry the brakes. Sometimes roads can be closed due to their fragile state after wet weather or because they are blocked by flooding. Road users should always follow recommended routes and obey signs closing roads to traffic. Watch out for washed out roads, earth slides, broken water or sewer mains, loose or downed electrical wires, and fallen or falling objects.